Dr. Allison Belger explores how to help people achieve their goals through interpersonal connections and heart-pounding fitness. We live in a technology driven world that makes it too easy to forget the importance of interpersonal connections. Adding community to someone's life can be a catalyst for success and life changes that would not be possible without the help of others. This is the heart of Dr. Allison Belger’s message in her first book, The Power of Community, to be released on March 20th. Dr. Belger takes the reader on a journey from her childhood in suburban New York as she follows her passion for fitness and sport, finding a new dimension in CrossFit, a functional fitness and conditioning program with an emphasis on camaraderie and community. She explains the transformative aspects of CrossFit's physically and mentally demanding workouts as performed with others. Drawing on her psychology doctoral research, Belger describes the emotional and physical benefits of participation in an affinity group such as this. “Communities can do wonders for people, and these groups don’t need to be formal or structured; they simply need to provide support, ongoing contact, and a sharing of experiences.” But she also goes further, sharing stories of military wounded warriors and everyday heroes who have faced life-threatening illness and overcome them with the help of community affiliation. She relates inspiring examples of individuals who have created communities and support networks for populations in need, including at-risk youth, cancer patients, and people recovering from addiction. Dr. Belger’s qualifications for writing this book are second to none. She’s a co-owner of four CrossFit affiliate gyms, a licensed psychologist and fitness coach as well as a mom of two young daughters. She knows first-hand the importance of community and having a network of mutual support and human connection in the midst of our hectic, technology-driven lives. A former division-one collegiate soccer player and five-time marathoner, she has also been part of the wilderness adventure community and has trained for various elite athletic events, competing both individually and as part of a team. With her unique perspective as psychologist and athlete, Belger explores the mind-body connection and how it can relate to all of us. 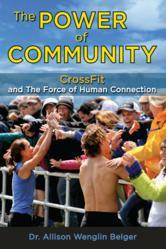 Through her compelling narratives, each of which intersects with the CrossFit experience, Belger encourages us to examine our own lives and relationships so that we may find motivation and meaning in a world of stress and challenge—if we are open to the power of community. Dr. Belger earned a BA from Dartmouth College, a Masters Degree from Northwestern University, and a Doctorate in Clinical Psychology form The Wright Institute in Berkeley, California.